Posh manager Steve Evans (right) and director of football Barry Fry before the 4-2 win at Bedford. Peterborough United manager Steve Evans insists his team are progressing nicely towards the start of the League One season. 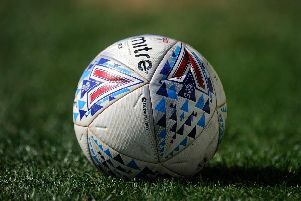 Posh beat Bedford Town 4-2 away from home today (July 7) to make it nine goals in two matches against step four opposition following a 5-1 win at Stamford AFC earlier in the week. Posh take on another step four side, Peterborough Sports, on Tuesday (July 10). Gwion Edwards cools down during Posh's 4-2 win at Bedford. Photo: Joe Dent/theposh.com. Summer signings Tyler Denton, on debut, and Siriki Dembele were among the Posh scorers today. Danny Lloyd and trialist Anton Rodgers also netted. Goalkeeper Conor O’Malley, striker Matt Godden and midfielder Jermaine Anderson missed the game because of injury, but left-back Colin Daniel played 24 hours after attending his mother’s funeral. Friday (July 6) signing, centre-back Josh Yorweth, also played. “I was pleased with them all,” Evans announced. “The conditions weren’t easy, but we scored some great goals, we showed good commitment to get into the box and we switched the play well. “It was tough to pick the best goal today because Tyler and Siriki scored stunners, while one of the Bedford goals was also fantastic. We need to score goals from more areas this season as we won’t be able to rely on Jack Marriott and Marcus Maddison. “There were a lot of good performances. Danny Lloyd deserved his goal, while Louis Reed and Adam King were decent in midfield. Fair play to Colin Daniel for playing in what must be a difficult time for him and his family. He played well too.